Obtaining funding for a wheelchair can be a confusing path; however, the US offers a variety of funding programs. Getting an expensive power wheelchair may be tricky but we will explore a few avenues throughout as well as provide necessary information. Before purchasing a wheelchair, talk with your doctor to help you decide what type of wheelchair is best. A standard wheelchair costs around 500 dollars. While an everyday chair can cost 1,000-2,000 depending on the features of the chair from cushioning, wheels, and framing. Electric wheelchairs, on the other hand, vary considerably. On average, the cost approximately 7,000 and can be priced as high as 30,000. Insurance is one way to get an expensive power wheelchair, but it can be a challenge. Typically, insurance coverage can cover anywhere between 50-80% of the cost. However, a physician is needed to send over the necessary documentation to your insurance provider. Securing this coverage, from your insurance or a government program such as Medicare, typically requires an in-person visit with your doctor before they send over any needed documents. Should you be approved, your copay will depend on the type of plans you may be enrolled in through your insurance. 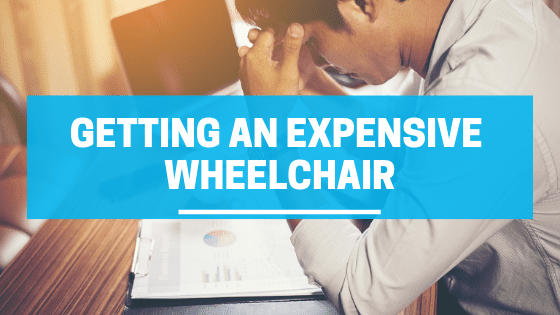 Typically, the criteria for qualifying for wheelchair financial assistance include limited mobility and health conditions that cause significant difficulty moving around. One would be unable to do daily activities within the home. And, one can safely operate a wheelchair or will have reliable assistance. There are also programs and associations that offer low-income families free or reduced-cost wheelchairs. They also provide assistance to individuals who require a wheelchair due to a specific illness; therefore, should an individual require an electric wheelchair they may be able to through this avenue. This program will cover the majority of an electric wheelchair follow a doctor’s consultation. A patient needs to meet specific criteria in order to qualify. Should a patient qualify, Medicaid can cover a wheelchair and possibly whatever cost is leftover that Medicaid did not cover. This associate will provide free wheelchairs and parts. However, they only distribute in Maryland, Virginia, and Washington DC. The program will take wheelchairs not currently in use and gives them to people in need within the US. Finding funding for a wheelchair, in general, can be confusing. However, there are many resources that can help you get an expensive power chair. It simply takes some research. Here is information on funding in general.